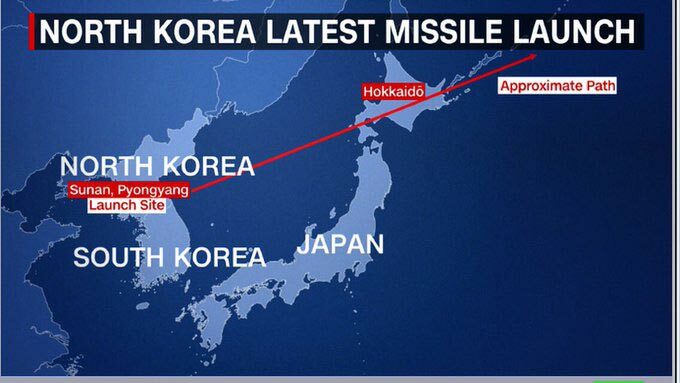 News broke this morning on North Korea launching rockets directly over Japan in what is the most brazen “test’ yet by the rogue nation and described by Japan as a "serious, grave security threat". The gravity of the incident was not missed by markets. Gold and silver jumped immediately off an already strong night climbing over 2.2% and the rush to the Yen saw our AUD fall making those gains more pronounced in our local currency. Wall Street was saved by the bell but futures trading on the Dow Jones has seen over 120 points lost, S&P500 down 0.7% and Japan’s Nikkei suffered a 225 point fall on opening to the news. The volatility index (VIX) spiked to 14 as well. Something different today. One of our favourite technical analysts is Andrew Hecht of the Hecht Commodity Report. He provides a balanced, unemotional view of commodity markets. Here is his latest gold analysis. It’s longer than we normally post but a fascinating read. “Gold tends to be a thoughtful commodity. The yellow metal has all of the characteristics of a raw material, but at the same time, it is a financial asset and a means of exchange or a currency. 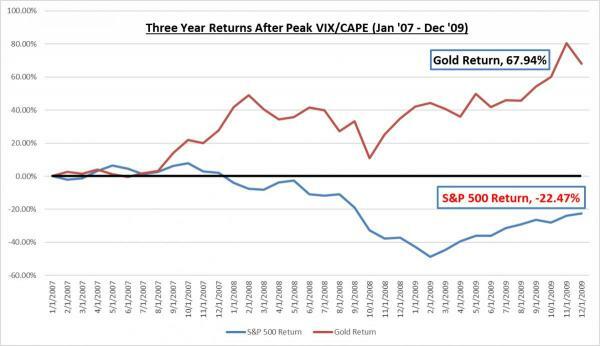 The historical volatility of gold tends to be lower than other commodities, but it is typically higher than the foreign exchange instruments of the world. While central banks and monetary authorities manage the exchange rates between their respective currencies, they hold gold as part of their foreign exchange assets. Gold is in a class by itself, and it has been around longer than all other financial instruments. The price of gold is often a reflection of fear and uncertainty in markets, and it is also a barometer of inflationary pressures on the global economy. Gold is an instrument that also has a long history as flight capital. The price of gold has not traded below $1,000 per ounce since October 2009, and it reached an all-time nominal high at $1,920.70 per ounce in September 2011. In December 2015, gold found its most recent bottom at $1,046.20 per ounce. It moved to a high of $1,377.50 in July 2016, and after making a higher low at $1,123.90 in December 2016, it began to rebound. On Monday, August 28, gold finally traded to the highest price of 2017 as it took out technical resistance and moved above the $1,300 per ounce level. Active month December gold futures contracts that trade on the COMEX division of the Chicago Mercantile Exchange had been flirting with the $1,300 per ounce level since the middle of August. On Monday, August 28, the patient and thoughtful yellow metal finally took off above $1,300 and rose to a high of around $1,317 per ounce. Gold moved higher as the dollar index fell to a new low for 2017, and bond prices strengthened after the market interpreted comments by Fed Chairperson Janet Yellen in Jackson Hole, Wyoming, as dovish. As the daily chart shows, open interest has been rising alongside price since late July. Open interest is the total number of open long and short positions in COMEX gold futures. On July 31, the metric stood at 436,962, and by August 25, open interest was at 516,831 contracts. Open interest increased by 18.3% over the period. Meanwhile, December gold rallied from lows of $1,211.10 on July 10 to highs of $1,317.10 on August 28, a rise of 8.8%. Rising open interest when the price is moving higher tends to be a technical validation of an emerging bullish trend in the futures market. At the current price, gold is at the highs of this year; it has taken out technical resistance and now has its sights set on the highs from last year. In 2016, gold hit its highest price since 2014 following the shocking results of the Brexit referendum. As the weekly chart illustrates, the next level of technical resistance for December gold futures stands at $1,377.50, the July 2016 highs. Momentum in the gold futures market is currently higher, and gold has been making higher lows and higher highs since last December. If gold can make it above the 2016 highs, we could be looking at a price that is north of $1,400 per ounce. 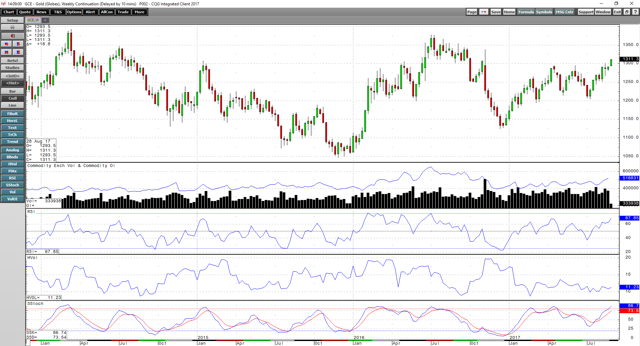 The signs have been supportive for a higher gold price over recent weeks, and after digesting market action in the commodities and foreign exchange markets as well as on the geopolitical and economic landscape, the yellow metal has decided that it was time to go back into bullish mode. We have witnessed a rebound in raw material prices since late May and June of this year. The price of iron ore, the critical ingredient in steel has rallied from $52.31 per ton to over $75 since June 13, an increase of over 43% in two and one-half months. The Baltic Dry Index, which is a barometer of the cost of shipping dry bulk cargos around the world, has moved from 820 on July 10 to over 1,200, an increase of over 46% in less than two months. Copper, the red metal that often diagnoses the state of the global economy has rallied to the highest price since 2014 and is trading above $3.05 per pound, making its latest new high on August 28 at $3.0870. The prices of other metals and minerals have also posted significant gains over recent months. While gold is a commodity, it is also a financial asset. The rise of a new breed of assets, digital currencies, has been nothing short of spectacular in 2017. 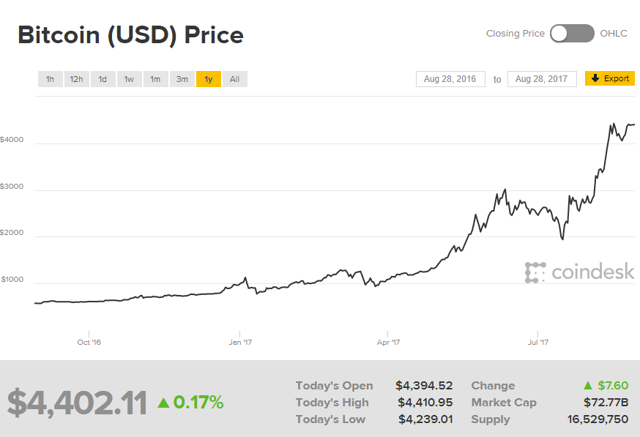 Bitcoin has appreciated from $968.23 on December 31, 2016, to over $4,402 on August 28. The leading digital currency has more than quadrupled in value this year. 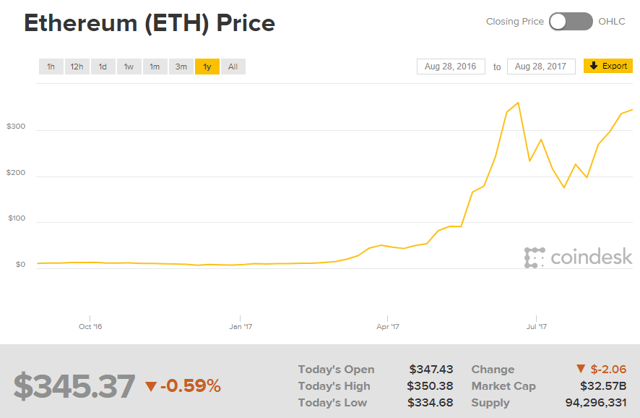 The price of Ethereum has increased by over 43-fold since the end of last year moving from $8 to over $345 as of August 28. These digital currencies have certain characteristics in common with gold. They are means of exchange, and their price paths are outside of the control of the world’s central banks, monetary authorities, and governments. At the same time, equities have moved to new all-time highs over recent weeks. It was about time for gold to make a move after thoughtfully evaluating the state of global markets. Additionally, the geopolitical landscape continues to reflect the potential for fear and uncertainty in the weeks and months ahead. The U.S. relationship with Russia has deteriorated to a post-cold war low, North Korea has become a nuclear power, and the rogue nation has made no secret about threatening the United States. China has tried to play the role as mediator as the tension on the Korean peninsula increases, and trade issues between the U.S. and China continue to present problems for the relationship. With the dollar moving lower, bonds higher, the geopolitical landscape rife with potential for conflict and other commodities prices moving higher, gold has attracted buying. The yellow metal has broken to the upside in a move that could just be the beginning of a powerful leg that will take the price much higher over the coming weeks and months. The technical picture for the yellow metal is now looking better than it has in a very long time. Longer-term charts for gold have turned bullish as the price has finally climbed above the $1,300 per ounce level. 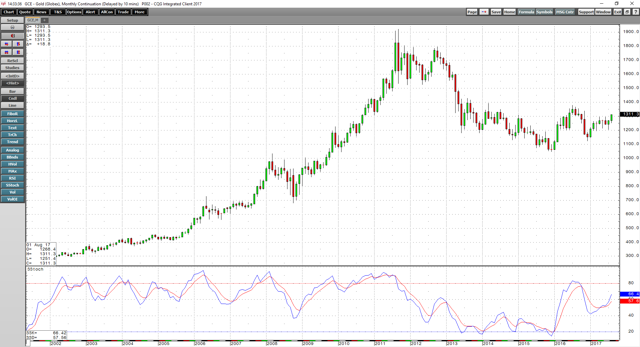 As the monthly chart shows, the slow stochastic which is a momentum indicator crossed to the upside in April, and after a period of consolidation, the metric now points to a rising trend for the price of the yellow metal. If gold can power through the next level of technical resistance at $1,377.50, the next target will become the August 2013 highs at $1,428 per ounce. Above there, it could be off to the races on the upside. The weaker dollar, stronger bond market, rallying raw material prices, and economic and geopolitical landscapes have combined to create a perfect storm for the price of gold. On the quarterly chart, a close above last quarter’s highs could ignite the price of the precious metal from a technical perspective. As the quarterly chart shows if the price of gold closed at the end of September above $1,295.20 the yellow metal will put in a bullish key reversal trading pattern. Gold traded below the Q2 lows at $1,214.30 during Q3 as it fell to $1,204 on the continuous contract. The Q2 high was at $1,295.20, and a close on the final day of September above that level would provide a significant technical signal for the gold futures market. 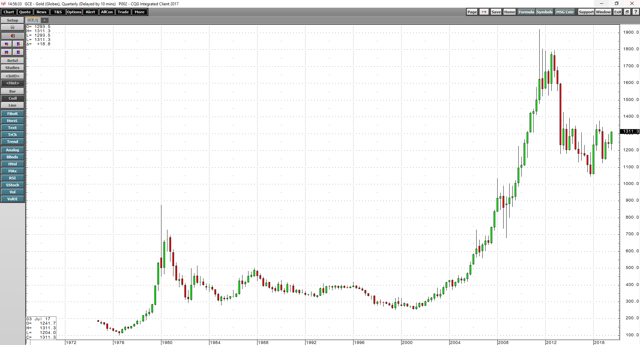 The last time we witnessed a bullish key reversal trading pattern on the quarterly gold chart was back in the third quarter of 1999 when gold was below $300 per ounce. While it took a few years for the precious metal to explode to the upside, the lows of $252.50 per ounce in Q3 1999 still stand as the bottom dating back to 1979.
many of the gains of the subsequent recovery.” Whilst most believe this could not rationally eventuate, she tellingly also said "betting on a rational US government can be risky." To be clear, these are the words of the world’s largest rating agency. 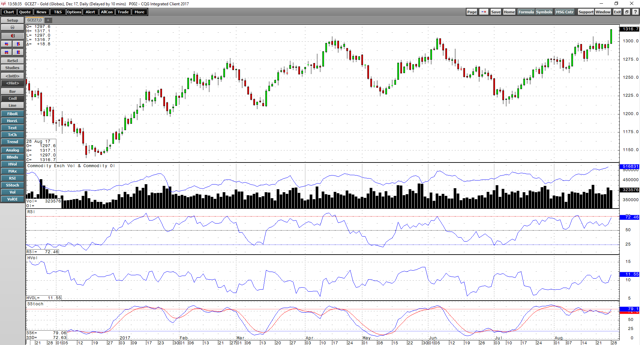 Such is the gravity of the situation the recent actions of Secretary of the Treasury Steve Mnuchin and Senate Majority Leader Mitch McConnell have got some in the market talking. Only last week they went and visited the infamous Fort Knox to verify the gold holdings of the US Government. That visit is only the third visit by a Treasury Secretary in history and the first government official inspection in nearly 45 years! The US reportedly holds 4,582 tonne of gold in Fort Knox, the biggest holding in the world, valued at around US$193billion. In the context of a Government about to default, that gold sits on the Treasury’s balance sheet valued at just $42/oz, not the $1308/oz at the time of writing this. Why could this extraordinary visit be telling? Put simply, under the US Gold Reserve Act of 1934, the Treasury could revalue the gold at today’s price and monetise this uplifted value through the issuance of ‘gold certificates’ to the Fed and have them issue newly ‘printed’ money accordingly. No new National Debt and no need for a new debt ceiling (for a little longer). Problem solved….for now…. BUT… this would go against decades of strategy of deliberately undervaluing gold so as not to highlight the lack of ‘value’ in the constantly eroding fiat currency adopted since they left the gold standard. The last time this accounting trick was deployed was by President Eisenhower in 1953. An extraordinary action indeed but let’s revisit S&P’s quote "betting on a rational US government can be risky." Trump is infamously anti-establishment, commercial and politically reckless. In that context such a move doesn’t seem out of the ordinary. Such a move would clearly be momentous for gold. Watch this space, 29 days to go…. 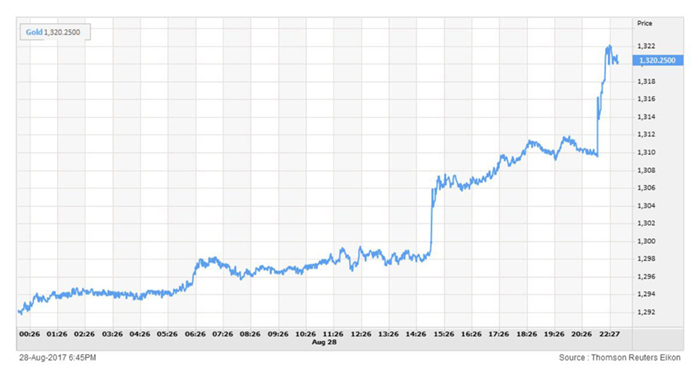 Gold continued its upward trajectory Friday night thanks to an awful jobs report out of the US (and at the time of writing is taking off again on North Korean tensions growing, up $15 on the open this morning). The monthly non-farm payrolls report for August was a shocker, hitting just 156,000 new jobs against expectations of 180,000 and also another quiet revision of June and July down by another 41,000. The unemployment rate rose to 4.4% and, importantly, average weekly earnings declined, taking the year-on-year rate to the lowest since the beginning of the year at just 2.2% (though still higher than Australia’s….). The number of Americans not in the labour force increased by another 128,000 to 94.785 million people. Shares actually went up on the news because bad news is good news when it comes to the main thing driving today’s sharemarket… debt. So bad was the report, and combined with hurricane Harvey, few now expect the Fed to raise rates this year. The free money game continues… It is this point and that declining wage growth that may be at the heart of what sees this epic credit cycle come to an end. You can’t enrich the few and leave the rest behind and expect social harmony. We have written often of the social impacts of QE and zero interest rates. But this is not solely a post GFC problem, it is a credit expansion problem that started way earlier. Indeed the GFC was just a reality check of what happens with too much debt. The next will be far far worse. 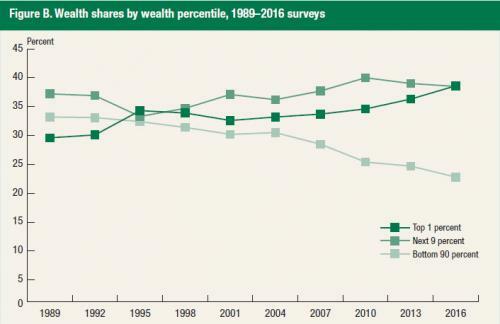 You can see it starts to really diverge from around 1980 and the graph below compares 1980 wealth growth (as a percentage) across the percentile range of income. 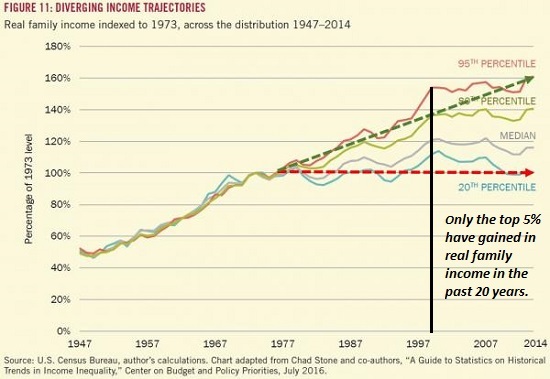 It is reasonably weighted with lower incomes gaining more as a percentage than the top earners (remembering a higher percentage of a smaller number is still a small number). 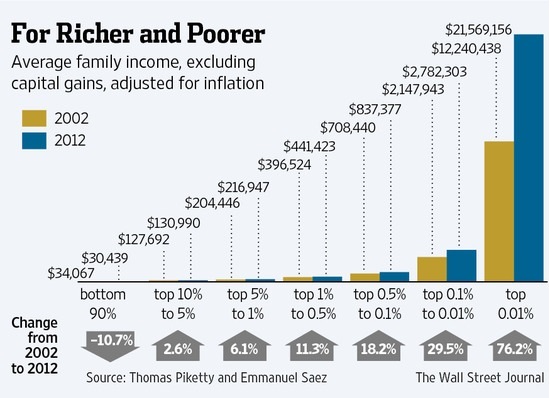 You then look at 2014 where the vast majority of growth is in that very top 1%. These are the people who hold the majority of the financial assets and jobs that have been inflated by the expansion of debt. The GFC saw ‘mums and dads’ try to enjoy this through getting subprime loans, growing house values, and redrawing off the same subprime loans. It didn’t end too well for them but Wall Street seemed to come out just fine thanks very much…. 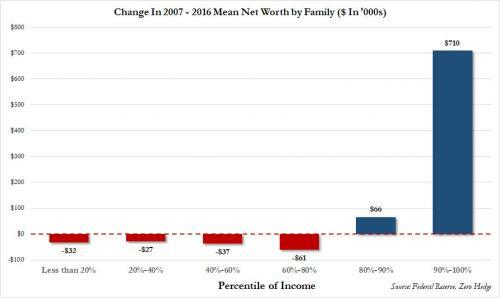 The graph below puts it in even clearer terms where you see the top 0.01%’s income up 76.2% in the decade to 2012, whilst the bottom 90% dropped 10.7%. 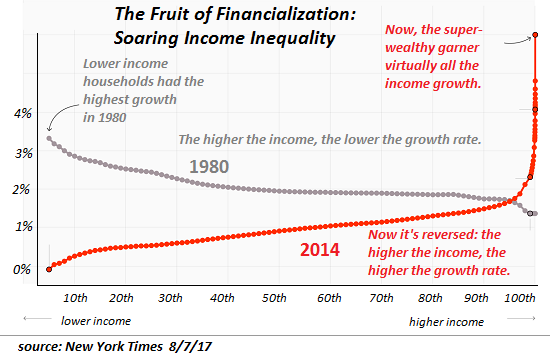 Critically too, this chart excludes capital gains, where again it is the top percentile that own most of the assets that have been wildly inflated by all the monetary expansion. Please don’t underestimate the importance of this phenomenon. Credit cycles end badly not just because the debt ends up too burdensome for the weak underlying economy, but the social divide and ensuing revolt make it unsustainable too. Brexit, Trump, etc are but tiny examples of what happens when the 90% voice their dismay. Suppressing rates for longer and throwing more debt to fix it, as will be the result of Friday night’s jobs report, will only make it worse… ironically for the very reason the report was so bad. 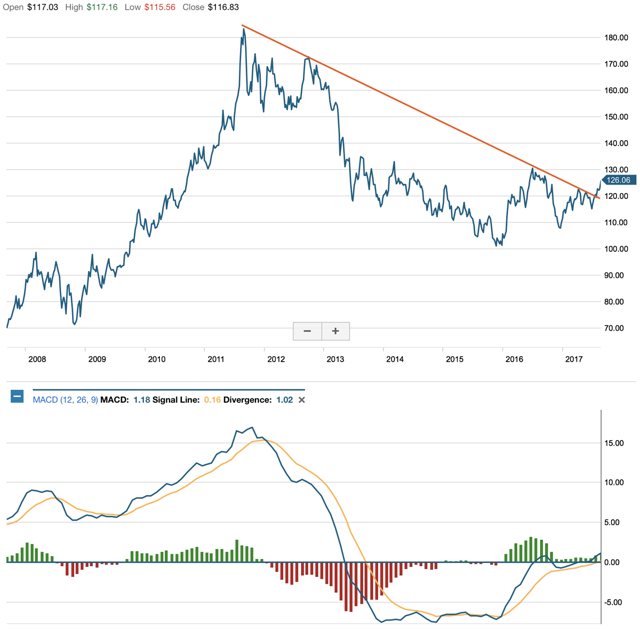 The gold price can see what’s coming…. Before we get into today’s article we’ve had a number of disgruntled customers voicing their concern over a misleading headline late yesterday (after the AFR article http://www.afr.com/technology/australian-gold-dealer-sees-the-digital-light-and-expands-to-bitcoin-20170828-gy5qob) saying “SHOCK! Aussie bullion dealer dumps gold for Bitcoin”. Whilst the text under the heading didn’t suggest we were ‘dumping gold’, loyal customers still took umbrage with the heading. Thanks for your many emails. We are on record as being fans of the publishing house from where this came. It was just a bit of sensationalist, loose wording, nothing more. We also don’t believe there was any malice in it. So if you are a newcomer to Ainslie off that heading, please let us clarify our position. We are in no way moving our core business away from gold and silver. We are however adding another monetary asset in the form of bitcoin to our customer offer. We are even expanding that offer to Ether and Litecoin. Why? Because that is what our customers want and no one else was offering the ease and security to purchase in person that we do. We also are the first to acknowledge, as stated in the above article, that some crypto currencies exhibit the same fundamental monetary properties as gold and silver. We are simply offering another monetary asset, not moving from another. We actually think they are quite complimentary. The analogy provided to the AFR but not printed was that gold and silver are most certainly the pre-eminent monetary asset with over 5,000 years of proven history. The periodic table we all learned at school tells us you simply can’t create gold 2.0 or silver 2.0 or platinum 2.0 out of the blue either. Bitcoin has been around now for just over 7 years. HOWEVER, we acknowledge that 5,000 years ago when money was shells etc, people may have queried these new shiny kids on the block, gold and silver. Maybe the same will be the case for bitcoin and the like? As we said in our article yesterday, some very smart people are saying the advent and use of the blockchain today is what the internet was to society 25 years ago. That is big. That is a generational game changer. “As worldwide government debt explodes, the search for other new or alternative forms of currencies is taking place. I'm not here to debate the merits of these cryptocurrencies, but to rather point out that I believe they signal the eventual rise of gold back to the top of the global currency game. While some postulate that cryptos are used mainly for nefarious activities, and that is the only reason for their existence, I believe their recent rise in popularity is because of the sorry state of government balance sheets. Goldman Sachs are one of the biggest and most respected investment houses in the world. They have just undertaken a review of the current US sharemarket bull run and concluded their clients should be worried. 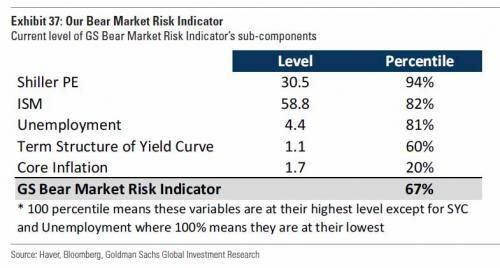 Goldmans apply economic ‘science’ to their analysis by examining no less than 40 different variables in what triggers a bear market. 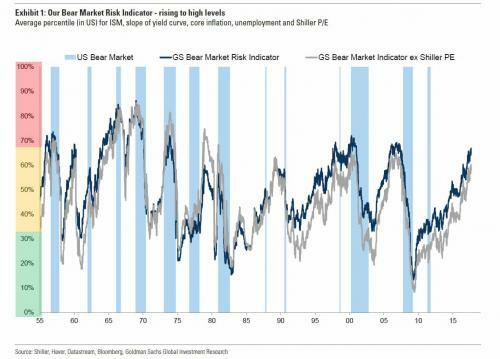 Of the 40 examined they then condensed this to 5 dominant factors – Valuation (using the pre-eminent Shiller PE metric), ISM (to measure growth momentum), bond yield curves (gauging safe haven investment) , and finally unemployment. And the result… a 2/3 chance of a bear market being imminent. One of the most telling charts for us however is the following one. We often talk about how this market is more to do with monetary stimulus than fundamentals – the “central bank bubble”. That a good look at all the asset bubbles below and then look at the various gauges of the real economy…. Now going back to that very first chart and you could well see this bull market continue on into 2019 if it were to outlast the 1990-2000 bull run. On some level you might even expect that given the unprecedented amount of stimulus applied to it since the GFC. There are 3 things to consider however. Firstly there is growing talk of the stimulus being unwound. Indeed this Wednesday the US Fed is widely expected to start it’s deleveraging of its massive QE amassed balance sheet. Secondly, logic would indicate the bigger the rise (especially when ‘artificial’ in nature) the bigger the potential fall. The GFC was because of too much debt and we’ve added over 50% more in the 8 years since. That 1990-2000 record we are chasing saw 80% declines on the NASDAQ at its end. Third and finally, Goldman Sachs just assigned a 2 in 3 chance of it happening soon. Feeling lucky? Today we officially launch Ether and Litecoin to the crypto offering beside Bitcoin. We’ve been selling these in the office for some time now but they are all now available for purchasing on line. Ainslie Storage Account – we look after this all for you with individual offline wallets held at Reserve Vault. (additional fee applies). Go to Buying Bitcoin for more info or to our Web shop to purchase. For some time now Australia has been the world’s second biggest gold producer behind China. The table below shows the top 5 producers in the world and Russia has been closing the gap on Australia’s second place for the last few years. In 2016 they were just 20 tonne behind. "The largest facility in Russia and one of the largest worldwide has been launched in the Magadan Region. The volume of ore processing will exceed 10m tonnes per year, while the volume of gold production will equal 13 tonnes per year. This brings the country’s gold production up by 5%, which makes Russia the second-biggest gold producer in the world after China,"
Now our math still has 13 tonne as less than the 20 tonne gap we saw last year but maybe they know of another 8 tonne somewhere not mentioned. Also the mine won’t be in full production until 2018 so our 2017 mantel looks safe. 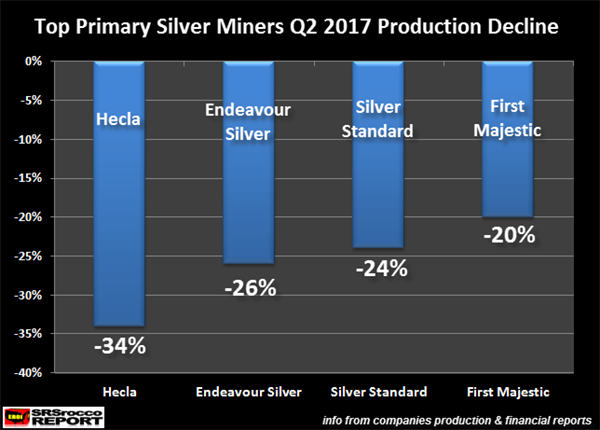 Irrespective the trend of closing in on our ‘silver’ medal in gold world production continues. The Russian central bank buys practically ALL the gold mined. China, too, does not export any of its gold. Australia on the other hand, sees most of its gold production leave the country. Perth Mint processes practically all our gold ore mined and most of that is exported. 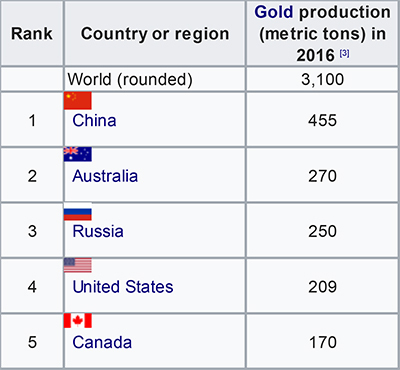 Russia has around 1715 tonne in gold reserves, China reports 1845 tonne (but no one believes it is that small), whilst Australia has just 79.85 tonne, and all of that held in London. 2 of the 3 above see what’s coming and are getting ready. Yesterday we highlighted the incredible amount of ‘money’ that has been created out of thin air by central banks. We use the term ‘money’ in that sentence loosely as that very same practice of the central banks undermines the ‘intrinsic value’ fundamental of what constitutes real money. The reasons are mixed and varied but they largely come down to falling yields, the ramifications of budget cut backs when the silver price was barely above production cost just a couple of years ago, and the labour and environmental challenges many of these mine experience in their remote and undeveloped locations. Of course this is not really reflected in the price at the moment as our new ‘paper’ world doesn’t care for such fundamentals as supply and demand… until the day when everyone wants the real thing and there simply isn’t enough. There are only 3 variables in the supply/demand/price economics 101 equation. Unlike central bank money you can’t simply add silver supply out of thin air. Silver supply is slow and constrained. When demand overcomes the paper trades or faith is lost in those paper contracts, that only leaves one variable… price. The recent German elections that saw a surge in support of the far right leaving Merkel with a slim victory and need to form a coalition, was yet another reminder of the rise in populism. This rise in populism is largely due to the “90%” feeling disenchanted, not only due to the immigration issues in Germany but the less spoken of effects of globalisation – the enrichment of the elite at the cost of the 99%. This same sentiment fuelled Brexit and Trump and now has the anti EU anti establishment party in the lead before the upcoming Italian elections. History is littered with examples of social uprising following years of suppression. So whilst Trump’s election has many scratching their heads, these graphs are a salient reminder why. This phenomenon is certainly not contained to the US, it is a global issue. The Bitcoin market has shot back up through US$4400 again just 2 weeks after the double hit of Jamie Dimon’s “fraud” call, and then the news of China closing down exchanges. News over the weekend showed both the power of a peer to peer network and also the growing acceptance at the highest level (Mr Dimon possibly excluded). Firstly, whilst China has shut down some of the biggest exchanges, Chinese traders have highlighted the beauty of a distributed ledger and a monetary asset with no intermediary. Whilst exchanges may be shut, the Chinese traders have simply turned to peer-to-peer marketplaces such as LocalBitcoins.com and messenger applications to trade directly with each other, negating the need for an exchange. "Not so long ago, some experts argued that personal computers would never be adopted, and that tablets would only be used as expensive coffee trays. So I think it may not be wise to dismiss virtual currencies." We then had reports out of the Wall Street Journal that Goldman Sachs are taking a different view to Mr Dimon and looking to deal directly in crypto currencies, joining the now more than 70 hedge funds active in investing in crypto currencies. Just back to Jamie Dimon speaking on behalf of his J P Morgan… There was evidence presented shortly after his statements showing that very same J P Morgan buying crypto in large volumes. Whilst they would most likely, and maybe correctly, argue they were buying for their clients at their request, one can’t help but wonder if the very same J P Morgan who is massively short silver futures but massively long physical silver holdings is playing its usual, alleged, tricks…. Irrespective it would seem bitcoin and other crypto’s are proving yet again they are resilient, real, disruptive and not going away lightly. And this demand driven price action all on just 0.3% of the world owning it…. On Friday we revealed China’s plan to offer gold backed yuan denominated oil contracts. It’s a must read if you missed it. There are various hypotheses around for what China’s agenda is for all their gold accumulation. (They are not alone by the way, Russia has bought around 200 tonne the last 2 years and is on track to do so again this year). Jim Rickards is on the gold backed SDR theory where the size of your gold pile is your pecking order at the table and equates that to seeing a gold price of $10,000 / oz. Bill Holter just this last week has changed his view from thinking China would never want the yuan to be the new reserve currency due to their trade balance and the headaches that come with being the reserve currency. He now has a new thesis and it makes a lot of sense. The following is in the context of our story Friday. Rather than paraphrase, here it is verbatim and you can make your own mind up…. “By making yuan convertible into gold, China in essences is creating a demand they know cannot be met by supply ... (again) AT CURRENT PRICES! Why would they do this? It is actually so simple I feel dumb for not seeing this previously. China actually kills an entire flock of birds at one time! First, they are THE largest owner of gold on the planet so they are in fact marking the value of their treasury up by multiples. The higher future price of gold will also make it very difficult if not impossible for other nations to catch up in gold accumulation. 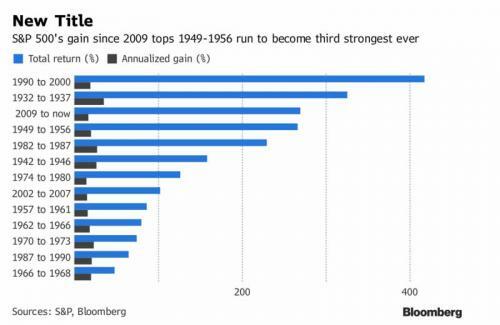 By freeing the gold price, China is assuring their place as a world financial leader for many years if not many centuries as that is their mindset. They know quite well, gold is lasting wealth and also the phrase "he who has the gold makes the rules"! Second, they will in essence be devaluing the yuan versus gold. This will have many benefits and too broad of a subject to breach here but think back to 1934 when the U.S. devalued the dollar versus gold, it creates "inflation" and makes debt easier to pay and service as well as giving a bump to the real economy. Next and of great importance, moving the world "naturally" to a gold standard means moving away from the dollar standard and all the unfairness that goes with it. A world moving toward gold (China) is a world moving away from the dollar. Surely the dollar will devalue versus the yuan via lower demand from the oil trade and also the lessening of "power" afforded as issuer of the reserve currency. The U.S has enforced the dollar standard by military use for years. Is this action by China "neutral" enough and free market enough to avoid military conflict? We can only hope and pray the U.S. does not kick the table over in reaction. Lastly and possibly most important, this scheme avoids the main pitfall Bretton Woods fell into, bleeding out treasury gold. If China refuses to convert yuan into treasury gold but instead buys the bullion on open markets they will never have their "De Gaulle moment". I know what you are thinking, there just isn't enough gold? And again I will remark "at the current price". You see, under this scenario China does not care how high the price of gold moves because they are along for the ride. The only thing they care about is not leaking ANY of the gold they have so carefully and methodically have accumulated over these years! Make no mistake, China will not convert yuan into THEIR gold, they will purchase gold on the open market to make the conversion. RBA V US FED - LOOSEN OR TIGHTEN? Gold and silver saw a nice rally Friday night as the monthly US NFP employment numbers showed the first negative print in 7 years, losing 33,000 jobs. This was offset by a strong BLS Household Survey print of 906,000, and the market reacted in an understandably confused manner. Whilst gold rallied the shares didn’t really know what to do as analysts focused on the positive news and upped their odds of a December rate hike by the Fed. As we’ve discussed before this potentially works for gold both ways as a December rate hike could be ‘that hike’ into weakness that causes the crash. “ “The thing that is causing an issue for us (the RBA board) is slow growth in wages, which is feeding into slow growth in household income,” Professor Harper said in an interview with The Wall Street Journal. “If you start to lose that momentum, that might be the basis of some sort of policy action,” he said. The Australian dollar dropped after Professor Harper’s comments hit the wires, from US77.97c to US77.75c. Retail sales fell 0.6 per cent in August, the biggest drop since 2013. It followed a 0.2 per cent fall in July, shifting momentum in the opposite direction to economists’ expectations, and fanning fears that record household debt and stagnant wages growth will sideline consumers and slow the economy. Professor Harper said the latest retail sales outcome was disappointing, but not alarming. “It is yet another indication that we are not out of the woods,” he added. It highlights too the dislocation between the two central banks of the US Fed looking to tighten and the RBA looking at easing. You will note more and more stories of late adding weight to the pressure on the USD as the world’s reserve currency. Many of these revolve around China (most recently here and here) or the IMF’s plans for the SDR (Special Drawing Rights), the latest of which saw their chief (Christine Lagarde) over the weekend publicly contemplate a blockchain based, bitcoin style, crypto SDR in the future to help achieve just that. Russia too is one to watch. The recent visit of Saudi’s King Salman to Moscow certainly drew a lot of attention. Saudi has long been a staunch ally of the US and integral to the petro dollar agreement which is a huge support to the USD’s reserve status. The Saudi’s are non too happy about the US acceptance of Iran and Russia looks to be capitalising on this. “The World Gold Council has reported that the Central Bank of Russia has more than doubled the pace of its gold purchases, bringing its reserves to the highest level since Putin took power 17 years ago. In addition to being party to the new Chinese gold backed yuan oil contracts, he reports that the Russians have created an alternative to the US dominated SWIFT international payments platform. The blockchain keeps rearing its head as a ‘new currency’ vehicle that mounts pressure on the USD hegemony. Any weakening of the USD is normally great for gold…. This week has seen two milestones for the world’s largest share index, the S&P500 in the US. This week it hit a new all-time high whilst also marking the 10 year anniversary of its final high before the GFC saw it lose more than half its value. Since the GFC the US Fed pumped $4.5 trillion into the system to save and then refloat it, and boy did it ‘work’. 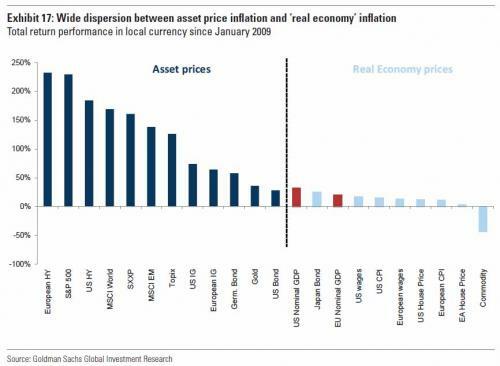 Deutsche Bank just released the results of how 38 of the main global assets performed since that pre GFC peak. So to be clear these are how things have performed since the peak, not the bottom. Interestingly too you will note many of the poor performers were from emerging markets and the still struggling Euro basket cases. The latter goes some way to explaining the following chart which shows how the ECB has overtaken both the Fed and Bank of Japan in the amount of money printing they have undertaken, buying up both sovereign and corporate bonds at a rapacious rate. So the elephant in the room remains… what happens when the Fed embarks on pushing that pink line down with QT (Quantitative Tightening), in tandem with rate rises, and at a time that the market is overvalued, at all-time highs, and hooked on the ‘juice’? What happens if the ECB start to plateau out their white line when they still have basket case nations not even above pre GFC highs despite the ECB pumping over $5 trillion into the Euro market? Yesterday we spoke of the “elephant in the room” with regard to the effect of central banks moving to tighten on global financial markets and there was plenty of news around this overnight. Last night the Fed released the minutes of their last meeting and they have been described as ‘schizophrenic’ in that on one hand they spoke of “many Fed officials concerned low inflation is not transitory," but then "many Fed officials saw another rate hike warranted this year". So our repeated warnings of a rate hike into weakness seem to be reiterated by the very instigator… Gold understandably jumped on the news… but shares kept going as well.. why? Volatility, or more specifically the lack of it, is most certainly one of the main themes in markets today. Simplistically that ever present central bank hand of support would explain it, so what happens when that is removed. Deutsche Bank just released a report that asks the question, is it complacency or are investors in ‘freeze’ mode amidst all the global uncertainty at the moment. They reference a similar thesis by the winner of this year's Nobel prize in economics, Richard Thaler of the University of Chicago. So what could move this from freeze mode to flight mode? "the most likely causes of a shift to ‘flight mode’ and a rise in volatility? Here’s one possibility: by the end of next year, the combined expansion of all the major Central Bank balance sheets will have collapsed from a 12 month growth rate of $2 trillion per annum to zero." "As we look at what could shake the panoply of low vol forces, it is the thaw in Central Bank policy as they retreat from emergency measures that is potentially most intriguing/worrying. We are likely to be nearing a low point for major market bond and equity vol, and if the catalyst is policy it will likely come from positive volatility QE ‘flow effect’ being more powerful than the vol depressant ‘stock effect’. To twist a phrase from another well know Chicago economist: Vol may not always and everywhere be a monetary phenomena – but this is the first place to look for economic catalysts over the coming year." Whilst they talk of this ‘catalyst’ coming next year, markets have taught us time and again that the only accurate predictor of a bubble bursting is hindsight. There is a famous saying in gold circles… better a year too early than a day too late. Casey Research put out a very logical position on why we should be seeing the Chinese ban on ICO’s (Initial Coin Offerings) last month as an opportunity not a threat to crypto currencies. They demonstrate that China has a track record of banning technology companies to allow their domestic equivalents to flourish. They banned Google as their domestic equivalent Baidu struggled, they banned Facebook so their own Tencent flourished, and Amazon and eBay allowing Alibaba to dominate… it’s a repeated pattern. Indeed the usual FANGS are nowhere to be seen whereas the five largest tech companies in China are Alibaba, Tencent, Baidu, JD.com, and NetEase. He claims to have insider officials confirming the ban is only temporary whilst they figure out how to regulate the industry. Just as Baidu etc took off once they removed the competition, Chinese based crypto’s too will take off once they are allowed back in the market. Whilst you might dismiss this as having nothing to do with you as a ‘mainstream’ bitcoin or ether holder (as the alt currency world is one you don’t play in) you need to remember that bitcoin and ether form the basis buy in for many of these trades and ethereum tokens often the vehicle for them. “…..Bitcoin is a digital currency that works by a blockchain technology. That technology just keeps track of who owns what, i.e., of the global leger of Bitcoin transactions. So the technology powers the coin. Recently we wrote about China’s potential plans around the gold market too. Communism is a dirty word in democratic, capitalist countries but the control it allows could well be a massive theme of any global currencies repositioning soon, be that digital currency or the world’s oldest, gold…. Late last year we reported evidence indicating, as with Peak Gold, we have likely seen ‘Peak Silver’ last year. i.e. 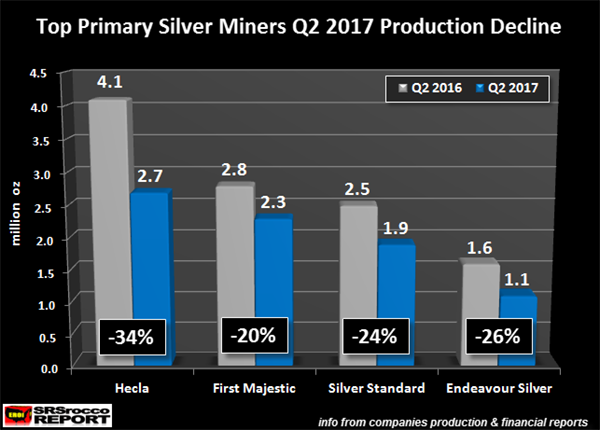 Gold and silver production are set to decline or at least plateau in the years ahead regardless of demand. “Mr. Lassonde, after a few difficult years gold seems to get its shine back. What’s next for the gold price? Right now, there is more demand for paper gold than for physical gold. For instance, when you look at the refineries in Switzerland they will tell you that they’ve got the bouillon but they’re not busy. It’s not like a year and half ago when they had no stock and the gold bars basically were flying off their shelf the minute they were produced. So the pressure is in the paper gold market, the futures market. Part of the recent strength of gold is what I call a risk premium on the world. There is a lot of speculation that has to do with the tensions around North Korea and President Trump. I don’t have a personal relationship with Mr. Trump but I know the man a little bit. When he was elected, my prediction was that he was going to tie up the US administration in a knot because he’s totally unpredictable. Nobody knows where he’s going and you cannot run a country that way. And what does this have to do with gold? Anyone else in the Oval Office would not make such outlandish statements as Mr. Trump makes. Gold (Gold 1285.64 -0.72%) is benefiting from that. After the US election, my prediction was that the dollar was going to suffer from Mr. Trump being in office. The price of gold is intimately related to the dollar. Gold is essentially the »anti-dollar»: If the dollar is strong, gold is weak and if the dollar is weak, gold is strong. So what we are seeing now is exactly what I have expected: a lower dollar and therefore a stronger gold price. So where do you think the gold will go from here? My view has been between $1250 to $1350 per ounce for this year and then slightly ramping up next year to around $1300 to $1400. But for gold to get into the next real bull market we need signs of inflation. So far we haven’t seen them. The Federal Reserve and other central banks have piled up huge reserves. But there is no inflation because the money is sitting within the banks and they are not lending it. Therefore, you don’t get a multiplier effect. But what happened recently in the US – the one-two punch with respect to the hurricanes »Irma» and »Harvey» – is going to require an enormous amount of reconstruction. This could finally move the needle on inflation. Also (ALSN 139.2 0.65%), Europe is doing much better. So at some point I suspect we are going to see inflation start to pick up a little bit. What does this mean for the mining industry? First of all, at a gold price of $1300 the industry by and large is doing well. I tell my peers: »If you are not making money at $1300 you should not be in this business.» So it’s a good price and you should be making good money. But the industry has had to shrink a lot. When the gold price dropped to $1000 at the end of 2015 everybody in the business was too fat. So the industry laid people off, consolidated, shrunk and many junior companies have been wiped out. Production is declining and this is going to put an enormous amount of pressure on prices down the road. If you look back to the 70s, 80s and 90s, in every of those decades the industry found at least one 50+ million ounce gold deposit, at least ten 30+ million ounce deposits and countless 5 to 10 million ounce deposits. But if you look at the last 15 years, we found no 50 million ounce deposit, no 30 million ounce deposit and only very few 15 million ounce deposits. So where are those great big deposits we found in the past? How are they going to be replaced? We don’t know. We do not have those ore bodies in sight. Why aren’t there any large discoveries anymore? What the industry has not done anywhere near enough is to put money back into exploration. They have not put anywhere near enough money into research and development, particularly for new technologies with respect to exploration and processing. The way our industry works is it takes around seven years for a new mine to ramp up and then come to production. So it doesn’t really matter what the gold price will do in the next few years: Production is coming off and that means the upward pressure on the gold price could be very intense. Why didn’t the industry put more money into exploration? The industry has had to shrink a lot. Also, the boom in Exchange Traded Funds has changed the capital markets in a huge way: Companies that are part of an ETF get treated like chosen sons. But when you’re not in an ETF you’re getting marginalized. You become an orphan and the junior companies in particular have been completely orphaned. How does that impact the funding of mining? “What’s your advice for investors who are interested in gold? It’s very interesting. When you look over a hundred years back there are periods of 10 to 30 years where you would rather be in the stock market. 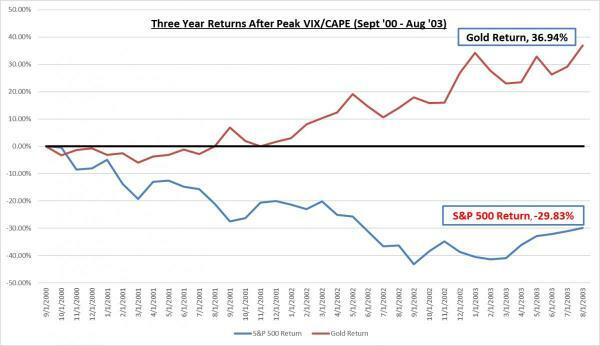 But then, there are other periods from 10 to 15 years where you would rather be in gold. In which period are we today? Let’s take the Dow Jones (Dow Jones 22997.44 0.18%) Industrial. To my mind, the Dow is essentially an expression of financial assets. Gold on the other hand is what represents hard assets: real estate, paintings and other hard assets. 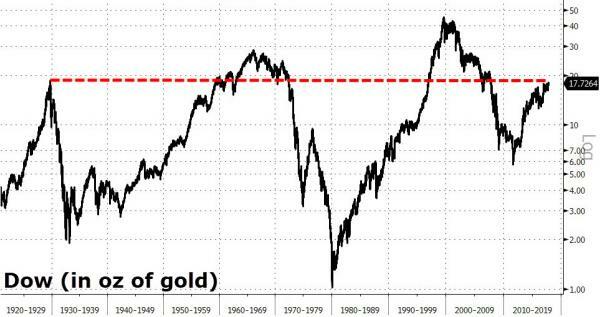 So when you look at the gold cycle from 1966 to 1980 [see the chart below], you can see that the ratio between the Dow and the gold price at the beginning topped out at almost 28:1: It took 28 units of gold to buy one unit of the Dow. Then the long term trend reversed and the ratio went all the way down to 1:1. A similar cycle took place in the 30s. The Dow crashed from around 360 in 1929 to 36 in the next years. So it lost like 90% of its value. On the other hand, the gold price went from 20 to 34 and the ratio essentially bottomed out at almost 1:1, like at the end of 1966 to 1980 cycle. And what does that mean for investors today? Peter Schiff is renowned for some famous and very public calls on financial events. Most recently he was very vocal about the impending GFC in 2006 and 2007 before that crisis unfolded. Whilst there were a few, like now, that were sounding warnings just because markets were high, Peter was quite specific about the cause and effect… and he was bang on. 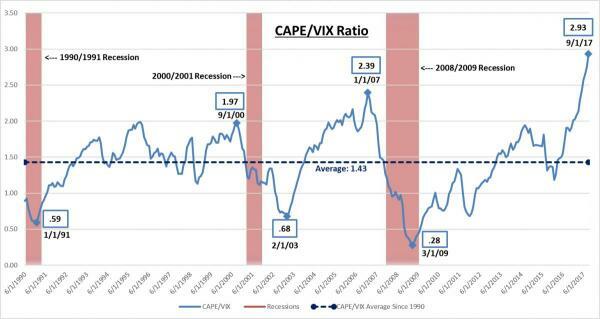 As we have written many times, this current market is notable for not just the high valuations on any number of measures, but it’s coincidence with incredibly low volatility (via the VIX). Indeed that relationship, as outlined by Schiff, is at an ALL TIME high. Those who sold their gold at its peak and bought underpriced shares have had a wonderful run since. In Australia, those who hung on to their shares have still not seen the pre GFC peak again. “It should be clear to anyone that since the 1990s the Fed has inflated three stock market bubbles. As each of the prior two popped, the Fed inflated larger ones to mitigate the damage. The tendency to cushion the downside and to then provide enough extra liquidity to send stock prices back to new highs seems to have emboldened investors to downplay the risks and focus on the potential gains. This has been particularly true given that the Fed’s low interest rate policies have caused traditionally conservative bond investors to seek higher returns in stocks. Without the Fed’s safety net, many of these investors perhaps would not be willing to walk this high wire. We’ve written a bit of late on the global loss of faith in the USD. What we think Schiff is saying is that the sheer amount of debasement (through printing so much more) of that currency that would be required to reflate the next crash would ultimately see any semblance of faith in it evaporate. A fiat currency is based on nothing but faith and the promise of a government and market bulls can only be so blind as to the real value of their financial assets. Today we add Ripple (XRP) to the crypto offerings alongside Bitcoin (BTC), Ethereum (ETH), and Litecoin (LTC). These four (along with Bitcoin Cash which we don’t trade) make up the top 5 of market capitalisation in the cypto currencies. Ripple is one of the oldest and is the 3rd largest with a market cap of $7.52 billion at the time of writing, still only a fraction of Bitcoin’s $98.6b and Ethereum’s $27.1b. “Ripple isn’t creating any other cryptocurrencies or proprietary coins for banks. XRP is it. That means that Ripple success directly equals XRP success. XRP will soon be more decentralized than even Bitcoin. Thomas recently wrote a blog post explaining how. So lets start off with one confusing factors. So I must make a distinction between Ripple the transaction protocol (which is used between banks and other businesses) and the ripple issued currency, XRP. When you see Ripple making gains its actually the XRP, the currency that is issued by Ripple, that is gaining. And this is actually quite different from the network protocol or Ripple protocol. Both share the same name and I’m sure this has definitely confused a lot of investors. So lets start off with the transaction network known as Ripple. So the Ripple protocol is based on technology that’s similar to blockchain but not completely the same. It doesn’t require any mining and its based on a consensus network instead of being consumer-facing which is what Bitcoin is. Basically, it’s for the everyday person. So now that I explained what is the Ripple transaction protocol, let’s move on to Ripple XRP. XRP is actually issued by Ripple Labs and is a form of cryptocurrency that can be traded and it’s not “mined”. So there is a finite number of ripples and that amount is actually issued by the company behind Ripple called Ripple Labs. Currently, it is freely tradable on numerous exchanges such as Poloniex. XRP by itself has no underlying related assets or values eg. Its not tied to USD or gold. Rather, it can be used to act as an intermediate currency in institutions. It has one huge advantage in that transaction costs are very, very low (unlike Bitcoin, which is now reaching 1.5 usd in transaction fees).